Players must surround their opponent’s queen bee while trying to block their opponents from doing the same. Each insect has a unique way of moving (as in chess) and resembles the movement of the insect depicted on the tile. In the land of Blue Clouds, anything can happen. 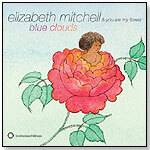 The clear and beautiful voice of children’s music favorite Elizabeth Mitchell weaves musical landscapes that “seem like a patchwork of memories we’ve always shared,” writes Caldecott Award – winning author Brian Selznick in the liner notes. The dreamlike illustrations of legendary artist Remy Charlip illuminate the magical narratives of these timeless songs. Mitchell’s extended family band, You Are My Flower, including daughter Storey and husband Daniel Littleton, embrace us with sound in a celebration of family, imagination and love. 16 tracks, 39 minutes, 32 page booklet. Launch date: October 2012. Packaged with a whisk and silicone baking cups, the Handstand Kids Baking Around the World Cookbook kit introduces children to the world of baking in a colorful, hardbound and illustrated book with new recipes from Arleen Scavone, two-time winner of Food Network’s Cupcake Wars, and founder of the famous bakery, Sweet Arleen’s. This cookbook features PB&J Cupcakes, South African Pumpkin Bread Pudding, and Carrot Walnut Cupcakes, among others. Launch date: January 2008. One of four styles, Sassy Black and White Shih Tzu is dressed to thrill in a pink leopard dress with hot pink satin bow. A soft pink bib attaches the dress around the neck with a cozy feel. Also available are Sassy Pug, Sassy Cream Shih-Tzu, and Sassy Bichon. — In a June 2013 survey, three out of 11 retailers told TDmonthly that Douglas was their best-selling plush brand. "The dogs are so soft and cuddly and they look very realistic. Plus, they are relatively inexpensive. We sell one almost every day!" Suzi McMullen, manager of e-commerce at Doodlehopper 4 Kids in Springfield, Va., said. The Fascinating World of Birds is part of a video series designed by BrainFood Learning to build confidence in science through fun and interesting content. The video series advances a child's education by showing amazing video footage along with narration describing bird features and abilities. This format is designed to expand a child's vocabulary as the video content grabs the viewer's attention and the vocabulary is absorbed. This animal DVD is appropriate for kids of all ages. Each bird is clearly identified and shown in their natural habitat keeping children engaged. More advanced children will enjoy learning larger concepts such as depth perception. Birds featured in this animal video include ostrich, penguin, Canada Goose, owl, hummingbird, woodpecker, macaw, pelican, American Robin, and eagle. A multi-section review reinforces information presented earlier in the video. The beginner level reviews show bird flash cards and what features are common among all birds. 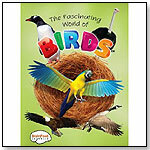 The more advanced levels quiz children on bird facts and broader scientific terms related to birds. The World of Entertainment, Publishing and Inspiration (World of EPI) was formed by Dr. Lisa Williams, a dynamic mom/former professor whose mission is expressing joy by providing children access to dolls that encourage dreams, promote intelligence, challenge perceptions, and open their hearts to all types of beauty. Abrielle is modeling her satiny lavender princess dress with a matching headband, slippers, and silvery studded earrings. Her high ponytail with long luxurious tresses perfectly complements her regal attire. She has beautifully bronzed skin and golden brown eyes. The Very Hungry Caterpillar™ Match and Munch Game uses the recognizable art from Eric Carle’s illustrated tale of The Very Hungry Caterpillar™ to help kids learn to identify healthy foods by practicing association and matching skills to help the caterpillar transform into a beautiful butterfly. The 55 food cards and 10 butterfly tokens are stored in the adorable caterpillar carrying case for easy transport and safe keeping. When kids are ready to play, each player receives 5 food cards to start and the remaining cards are placed in a pile. The goal is to complete a hand of either, five oranges, a hand of four strawberries and one apple, or a hand of three blueberries and two pears. 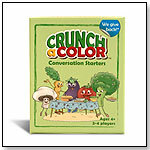 Crunch a Color Conversation Starters brings the whole family together at mealtime by inspiring creative thinking and healthy discussions. Chock-full of curious questions and delightful dilemmas, these 104 conversation starters help kids share their thoughts, grow their ideas, and make mealtime fun. Developed with teachers, parents and kids, Crunch a Color® Conversation Starters spark interesting, open-ended discussions that are engaging for kids (and adults) of all ages. — As of 1/17/2013 this product had 5 out of 5 stars from 22 reviews on Amazon.com. Tech 4 Kids has gone back to the drawing board to reinvent the board itself, with a new and unique artistic sensation. Each 3-D Magic creativity station gives kids an innovative designing world to generate a 3-D artwork, allowing them a new way to let their creativity run wild. This product magically transform designs into vibrant 3-D artwork by using the magnetic coloring studio and colorful 3-D Magic Dots. The unique magic dot pens allow children to place the 3-D Magic Dots to color in the stencil design bv either creating a single spot or make trails of multiple dots by running the pen across the screen. When finished, they sweep the dots into the sorter compartment and watch as the dots magically return back into the pens with absolutely no mess. Players pick and discard through a full deck as they try to get one of the three combinations to shoot for a goal. Each team has 11 players, 3 super-subs and a coach. Enjoy light and fun strategy as the shooter and keeper try to outsmart each other on shot attempts. There are three ways to shoot for a goal: Collect 3 positions (Striker/Midfield/Defender) or collect any 4 jerseys in your team or collect 3 jerseys that add up to 30 points or more. Kids are using simple math skills while having fun. Viewing products 131—140 out of 1181 products.